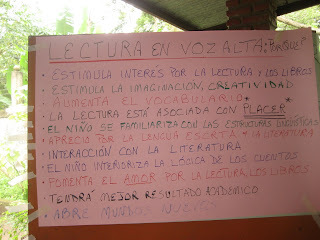 Puedo Leer, the library program I am involved with in Granada, held a training Monday for the teachers at two rural schools close to Granada. I went out with Helen and Carol, Library founders and board members and Ruth the librarian to see what was going on and to take pictures. The purpose of the training is to familiarize the teachers with the idea of reading aloud to the kids and silent reading for pleasure. 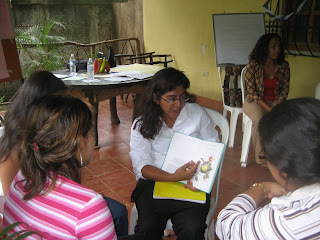 The trainings are jointly sponsored by the library and Libros para niños a Nicaraguan non profit that operates reading programs throughout the country. The teachers had suggested having the training at a nearby restaurant, which turned ou t to be a lovely setting for an offsite. 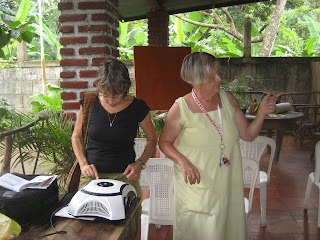 Carol and Helen got everything set up including a DVD projector. Carol had made banana bread and cookies for treats, because she said, the teachers here get so little. Any little extra is well deserved and appreciated. The teachers show ed up a little late; there had been some changes and confusion about times, but they loved the treats and everyone signed in so that the attendance could be submitted to the Ministry of Education. 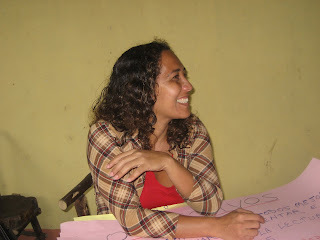 The training was like the early literacy trainings teachers of young children in North America are familiar with. We started by sharing our earliest memories of books and stories. I was with a group of 3 teachers, mostly younger than I am who grew up nearby. They all had similar memories. There were no books in their homes because they were too expensive, but they remembered vividly the stories their parents and grandparents told them. Some were legends, some were stories about their early lives, some were made up stories. One teacher said her older brother received a book when he started school, but she didn’t have her own book until she was in second grade. And these are not stories from some distant time of want in Nicaragua. Kids here just don’t have access to books to read. Sometimes there is a text book or two in a classroom, but nobody has books at home to read and there are hardly any lending libraries at all let alone ones full of books for children. The schools don’t have classroom or even school libraries. These teachers were so excited to receive a bookcase with 100 or so children’s books for each school. 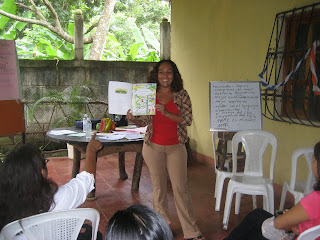 The teachers talked about their classroom experiences with kids and stories and books Ruth modeled her participatory method of reading aloud honed from years of work with kids in the library. She is a real pro. The teachers practiced reading aloud in their groups. They made plans for when they could work reading aloud and silent reading into their school days. The teachers commitment to their students, enthusiasm for reading and love of learning was so evident. 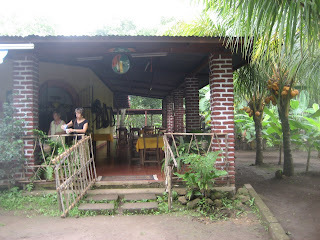 We had a yummy lunch of pinto and chicken. Helen horrified everyone by turning down her soda and giving half of her chicken to the dog. Ruth said the teachers thought she should have shared those with someone else. One teacher ate two lunches and took one home. After lunch the teachers got to see the bookcases that will be in each school and started working with the books to inventory and organize. Everyone was dragging and ready to go home, but when the books came out, they all perked up and it was ha rd to tear them away from taping on the labels when we wanted to wrap up and go home. Two organizational things were really challenging to them – they all had to learn how to use the combination lock on the cases and how to alphabetize the books. Now I still have nightmares about getting into my locker in high school so I understand the difficulty with the locks, but teachers who don’t know how to alphabetize? Then I thought when we alphabetize in the classroom. It is always for organizing either students or things. They are not so organized here, and I think it is because there is such a lack of everything, that you don’t need to organize it. If you only have a few b ooks, you can see them at a glance and don’t need the system we all know to find one thing quickly among many things. They asked for a dictionary because it turns out neither school has a single dictionary. I got one at Gomper today for them, b ut they didn’t have two. 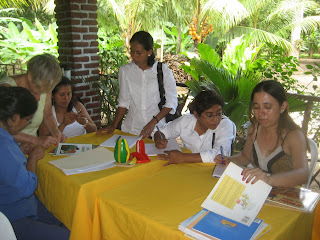 The teachers loved the workshop and want to have one every week, with lunch. 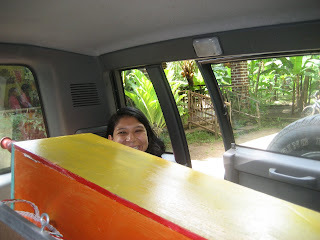 We delivered one bookcase along with 5 teachers to main road and we were really squished. 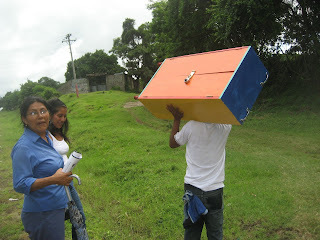 When we got to the school, a guy saw us and came down and hoisted the case on his shoulder to carry into the school. 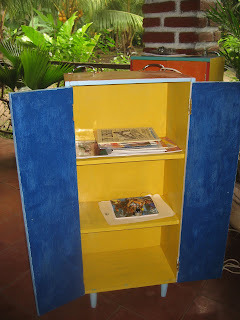 The teachers will get some more books for their school and then about 10 library books every two weeks for the children. I’m really interested in how they incorporate the workshop into their day. I know from experience what it is like to be excited about new classroom techniques and then return to the reality of my own classroom and habits and fall back into doing everything the same way. 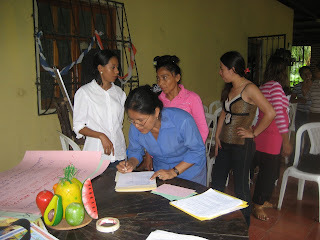 We hope to follow-up with another training in a few months to support them. Now friends, think about the mountain of books you bought for your children or grandchildren from Barnes and Noble or Goodwill. Think of the piles of beautiful picture books you brought home from the library as a child. Imagine what it is like to live without those. Think of growing up without Laura Ingalls Wilder or Anne of Green Gables or even He loise! Please help us out! http://www.buildingnewhope.org/puedo-leer.html if you do donate online, send me an email so I can be sure it goes to the right program.